In stock -This product will ship today if ordered within the next 4 hours and 32 minutes. 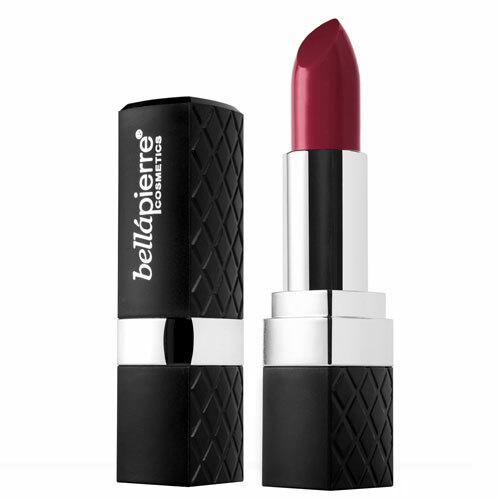 Bellapierre Mineral Lipsticks have been formulated with natural waxes and mineral pigments, iron oxides and antioxidants such as Vitamin C and Vitamin E.
Bellapierre`s smooth, silky, 100% natural and formula delivers long-lasting nourishing color. The mineral pigments also provide natural protection from the sun. Mineral Lipsticks do NOT contain lead, lanolin, parabens, or other harmful ingredients. Ricinus Communis (Castor) seed oil, Helianthus Annuus (Sunflower) Seed Oil, Candelilla Cera (Euphorbia Cerifera), Castor Isostearate Succinate, Caprylic/ Capric Triglyceride, Cera Alba (Beeswax), Copernicia Cerifera Cera (Carnauba wax), Hydrogenated Castor Oil, Simmondsia Chinensis (Jojoba) seed oil, Lonicera Caprifolium (Honeysuckle) Flower Extract, Lonicera Japonica (Honeysuckle) Flower Extract, Tocopheryl (Vitamin E), Phytosterol (Vitamin C), Tetrahexyldecyl Ascorbate, Vanillin. May contain : [+/- CI77091, 45410, 15850, 77491. 77492, 77499]. Below are reviews of Bellapierre Mineral Lipstick - Cherry Pop by bodykind customers. If you have tried this product we'd love to hear what you think so please leave a review.